Google Nexus launch postponed due to Hurricane Sandy | What Hi-Fi? Google has postponed today's Android event, which was set to launch new Nexus smartphones and tablets, as New York braces itself for the arrival of Hurricane Sandy. The event was set to see Android partners, LG and Samsung, launch new Nexus devices, with LG's Nexus 4 phone and Samsung's Nexus 10 tablet set to be the headline products. Many details on both products have already leaked however, with Carphone Warehouse last week even putting the Google Nexus 4 online on its website. The Nexus 4, manufactured by LG, is set to feature a 4.7in screen with a 1080 x 768 resolution screen. It will support NFC, feature a quadcore processor and have an 8MP camera. As with all flagship Google products, it will ship with Android 4.1 Jellybean. It's expected to have just 8GB of storage. 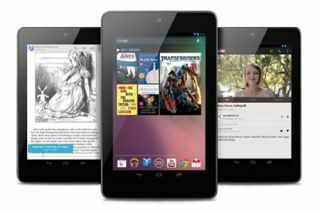 Details reported on The Next Web suggest that the Samsung Nexus 10 tablet will have a 10in, 2560 x 1600 resolution, 300ppi screen. There also looks set to be a 32GB Google Nexus 7 tablet, which will go on sale for just £200 – £150 less than the equivalent 32GB iPad Mini – in time for Christmas.